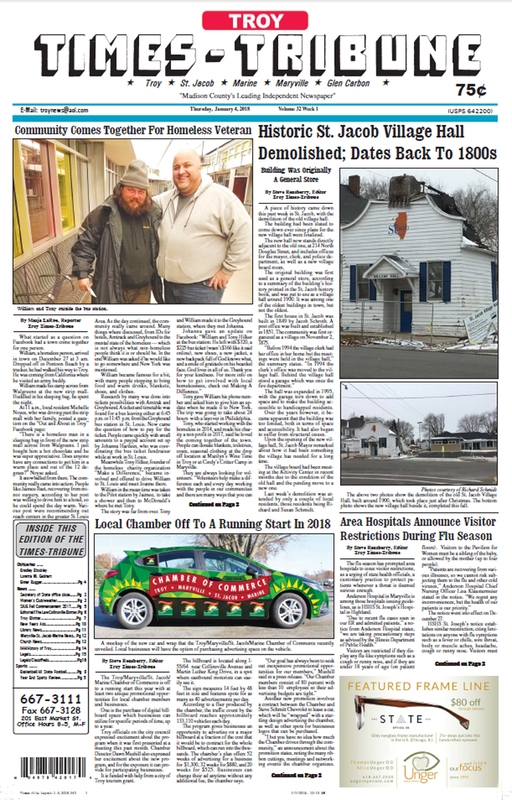 The January 4, 2017 edition of the Troy Times-Tribune is available! 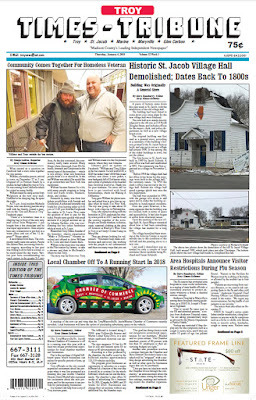 Some of the top stories in this issue: Historic St. Jacob Village Hall Demolished, Community Comes Together for Homeless Veteran, Area Hospitals Announce Visitor Restrictions During Flu Season, Local Chamber Off To A Running Start in 2018, Triad Wins 111-106 in Overtime Game; plus we have our special Year-In-Review coverage, a special advertising section wishing the cheerleaders good luck at competition, police blotters, an editor's column, and more. This issue has obituaries for Elmer F. Schrage, Mary A. Bingenheimer, and Mary Ann Sanderson.